When Fans enter the ballpark, they assume the risk of serious injury, not only by a wicked line drive or flying bat, but from a fall over a low railing, fights with other fans or players sparked by the unrestricted sale of alcohol, and yes, even the team mascot. Miami attorney Jack Herskowitz, recounting his own near tragic experience at a baseball park, exposes the many dangers that lurk at the ballpark with true stories of spectators who have been seriously injured, because Major League Baseball, its teams and stadium operators, refuse to protect the fans, knowing that the law shields them from lawsuits. Why should you read Danger at the Ballpark? Danger at the ballpark is an eye-opening read, especially for your American audience. It’s funny and intriguing and deals with a danger that injures (and kills) fans multiple times a year. In 2016 Jack published his 800-page autobiography/legacy book with TriMark Press, titled Jack’s Story: 75 Years and Not Counting. What do you think of Danger at the Ballpark by Jack Herskowitz? Have you had any first hand experiences of the dangers at sports events? Please leave a comment below. There’s love in sharing, so please click on one of the social icons to share this post with your network. 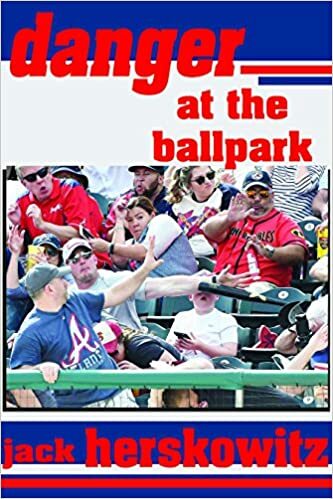 This entry was posted in Uncategorized and tagged 2017 by Jack Herskowitz (Author), Danger at the Ballpark, Danger at the Ballpark by Jack Herskowitz, Danger at the Ballpark Paperback – May 1, Danger at the Ballpark Paperback – May 1 2017 by Jack Herskowitz (Author), Jack Herskowitz. Bookmark the permalink.